I figured I would give you a break from all the pear recipes (don’t worry, I’ve got a couple more coming) and share muffin recipe with you. I’ve mentioned my like of obsession with Starbucks muffins before, but I don’t think I’ve ever tried to actually duplicate them before. My favourite kind is blueberry cranberry bran. I know, bran sounds like healthy grown up food. The first time I bought one I thought it was chocolate (I believe the good people at Starbucks are putting molasses in their muffins to give them a deceptively dark colour. Sneaky, very sneaky). With my first bite I experienced disappointment that there was no chocolate in the muffin. With my second bite I realized that bran is delicious. It has a flavour that I want to call nutty, but I’m not quite sure that’s the right word. Whatever the flavour is, I’m hooked. I decided to make my own bran muffins, based on a recipe from The Joy of Baking (love that site, by the way). The recipe calls for molasses which I didn’t have on hand. After a quick check with Janice, I decided to replace it with wildflower honey. I also used a combination of coconut sugar and brown sugar. 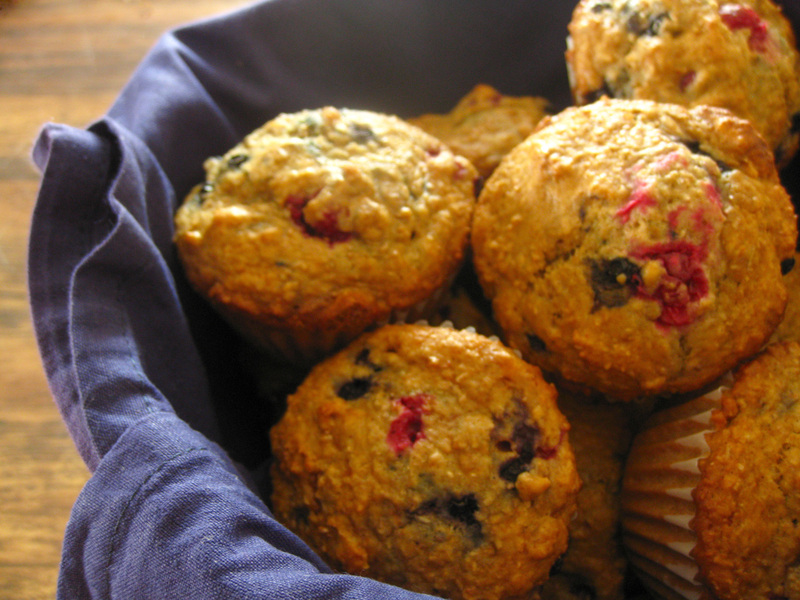 The muffins were moist and flavourful, with just the right amount of sweet to balance the tart of the cranberries. In a separate bowl, mix together egg, honey, vanilla, butter, and buttermilk. Create a well in the dry ingredients and pour the wet ingredients in. Stir until there is no visible flour. Try not to overmix. Bake for 18 to 22 minutes. Let cool before serving. These muffins look so good! I wouldn’t mind having one of those for breakfast with my cup of coffee (even though it is not Starbucks most mornings). One thing I have never heard of, or seen though is coconut sugar. Where do you find that? Whole Foods carries it, and I’m sure most health food stores do too. It doesn’t taste like coconut at all. It’s got a flavour thats similar to brown sugar, just less sweet and with a much lower glycemic index. Yum… They look so hearty. I love that style muffin. I will have to look for the coconut sugar, something new to me:) Your muffins look beautiful, watch out Starbucks! We’re a group of volunteers and starting a new scheme in our community. Your site offered us with helpful information to paintings on. You have done a formidable process and our entire community can be grateful to you.